This enables to reach to the application servers and finally applications. The next step was 2003, with 802.11g, where OFDM was used (also described in details later on in this course) supporting throughput of up to 54Mbps. As it is deployed at 2.4GHz, the range stayed similiar. 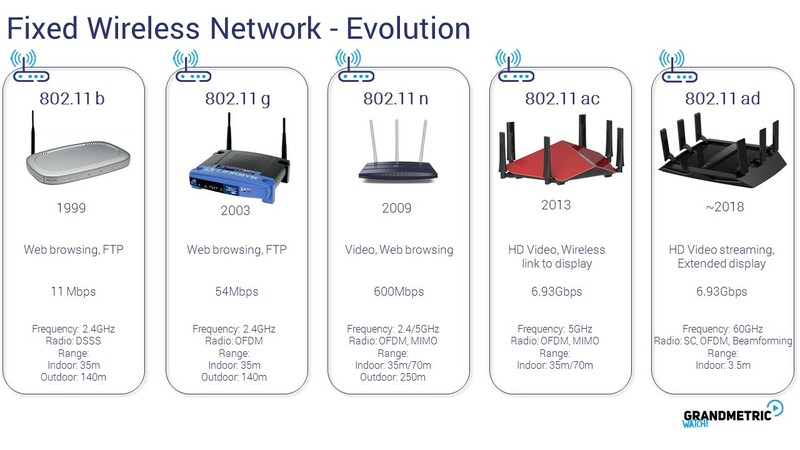 6 years later the next generation came with 802.11n which, by using larger BWs at 5GHz and MIMO schemes, improved the throughput by over 10x ending up in maximum data transmission speed of 600Mbps. Due to using multiple antennas, also the range could be improved. The most recent standard is 802.11ad to be soon finalized. This one uses very high frequencies – namely, 60GHz band, and due to that, the range is highly limited – to 3.5m due to high pathloss and low penetration. We will elaborate on the detailed aspect of those standards in the other section of this track. 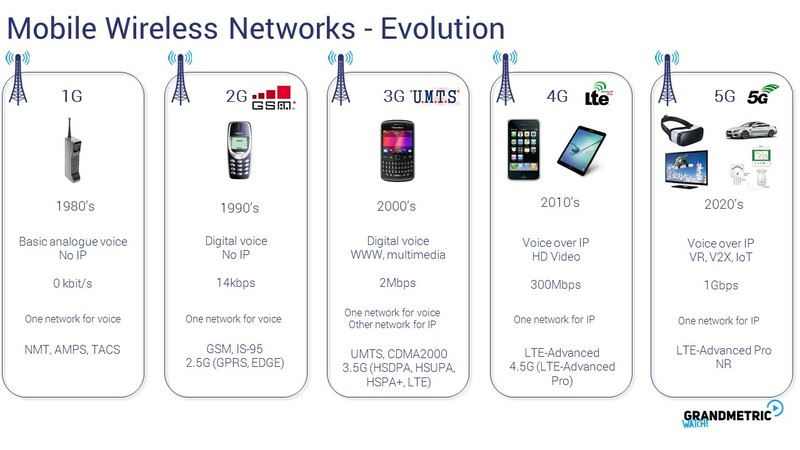 The next generation 10years later, namely 2G, brought digital voice…..
One of the major differences between the mobile wireless systems vs fixed is the way they access spectrum – i.e. 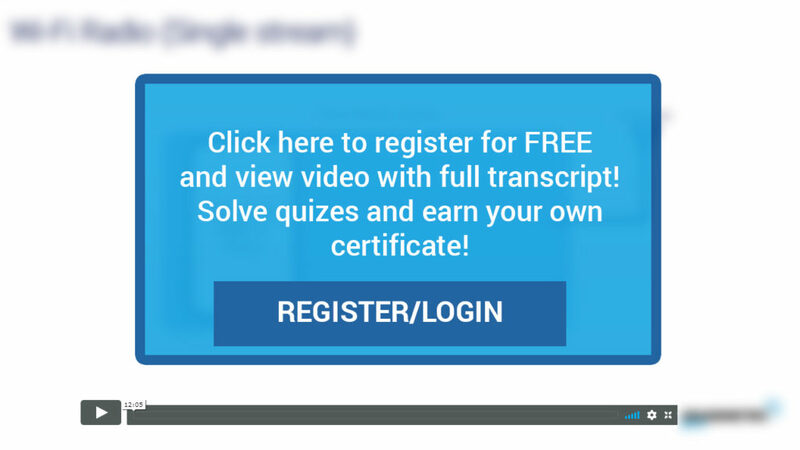 either through licensing or as free use. This table shows the differences and main characteristics of both. 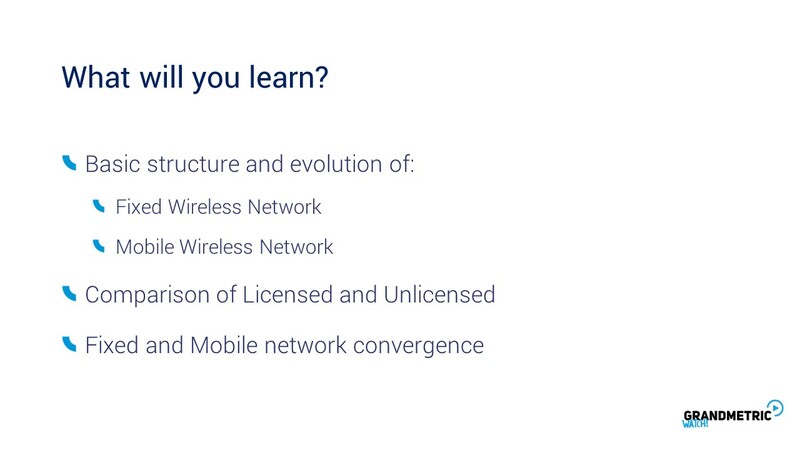 Both words merge more and more in case of carrier wifi as the MNOs want to reach to unlicensed „free” spectrum where most of the traffic recently goes. Most recently more advanced schemes came into play, namely the aggregation of resources / radio links between those networks. 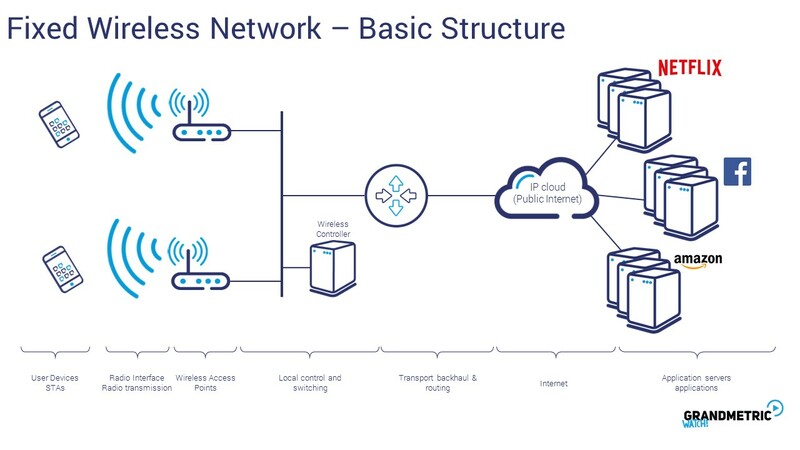 The first scheme is when the user is informed about the wifi network nearby, and is configured by LTE / mobile network to perform standardized measurements and to provide the results to the mobile network controlling the connection. 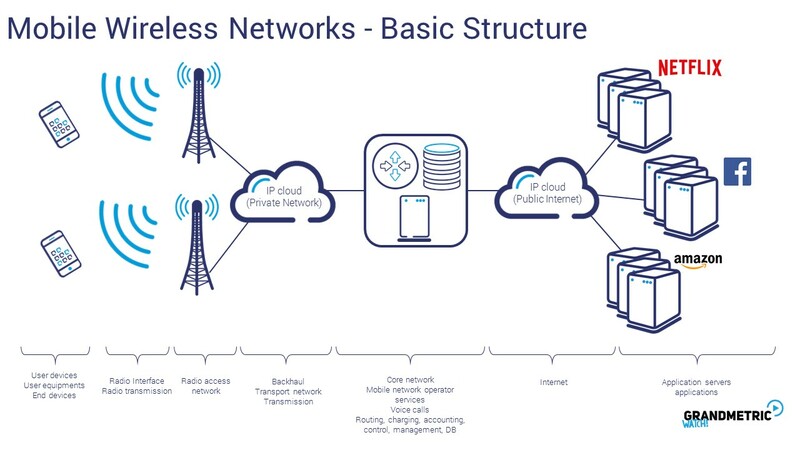 And based of the decision, the traffic may be switched to WiFi, or added as a secondary link where the control is still kept at the mobile network, and the data can come trhough either mobile network or through wifi or through both. 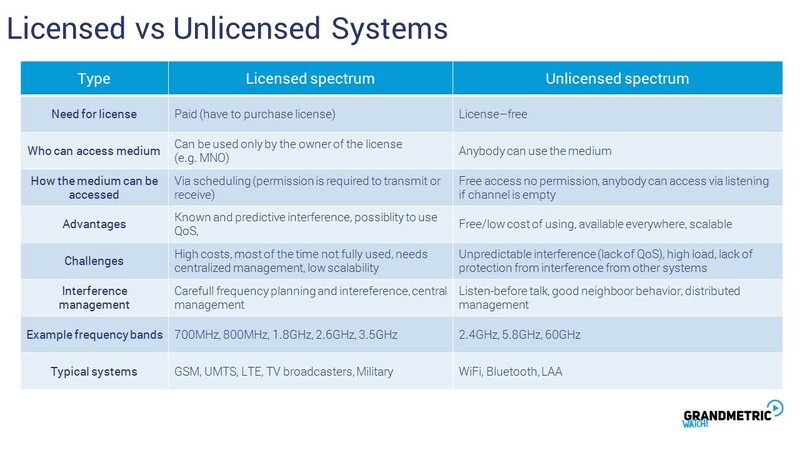 Addtionaly very recently the mobile industry has standardized its own radio enabled to be used in unlicensed spectrum – called LAA (licensed assisted access). 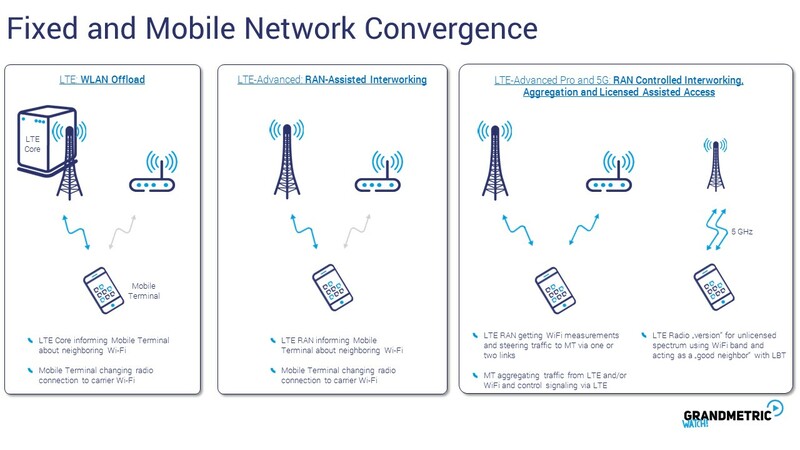 This is an LTE radio tailored to be used in WiFi bands, which should fulfill requirements of being a good neighbor – i.e. should not impact wifi networks more than yet another wifi network.